The greening of religion has left virtually no tradition untouched. Evangelical Christians are combating climate change; the Vatican has pronounced environmental pollution a sin; congregations are changing their lightbulbs, recycling their wastes, and preaching environmental messages from the pulpit. Environmental concerns have also transformed the academic study of religion. 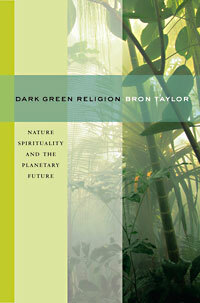 What has received less attention from the media or the academy is the emergence of what Bron Taylor calls Dark Green Religion, a phenomenon largely distinct from the greening of traditional faiths. Adherents to Dark Green Religion (DGR) regard nature as “sacred, imbued with intrinsic value, and worthy of reverent care” (ix). “Dark” here connotes two things: an unusual depth of commitment and connection to nature, as well as a “shadow side” seen in DGR’s occasional expression of violent, misanthropic, apocalyptic, or otherwise religiously and politically regressive worldviews. Taylor keeps the shadow side of these religions continually before us, even as he maintains that there is little reason to fear them. He evokes images of DGR as a “phantom” or “apparition” whose presence might go undetected unless viewed with the proper lenses. The lenses Taylor offers consist in part of a fourfold typology that he introduces early on. Taylor’s categories are premised upon an “operative definition of religion” that “does not presume a belief in nonmaterial spiritual beings” (xiii). Thus he identifies two types of “Animism”—one supernaturalistic and one naturalistic—and two types of Gaian Earth Religion, likewise subdivided into supernatural and naturalistic forms. Animists, of whatever stripe, tend toward vitalism, perceiving soul, consciousness, or intelligence in living things and inanimate objects; Gaian religion of either variety is informed by James Lovelock’s vision of the earth as a living organism, an interdependent whole. Supernaturalistic varieties of Gaian religion look to “nonmainstream” science while naturalistic forms hew more closely to the mainstream (16). These categories are not mutually exclusive. Seen through Taylor’s lenses, familiar figures begin to take on some new and surprising characteristics. We find, for example, Charles Darwin embracing ideas (such as kinship with all lifeforms) characteristic of Naturalistic Animism, as well as sensibilities (wonder and awe at life processes) that resonate strongly with Gaian Naturalism. Taylor is not overly invested in typologies or terminology. He is more interested in exploring the many “shocking, promising, and perilous” forms of expression that nature religion may take (126). One chapter traces the historical precedents for DGR in thinkers such as Henry David Thoreau (whose influence is enormous; Taylor includes a lengthy appendix on Thoreau), John Muir, and John Burroughs. Taylor then turns to a number of case studies of DGR that include radical environmentalism, surfing as a spiritual subculture, and the nature spirituality inhering in Disney creations (both film and theme parks). He also examines the nature-documentary craze more generally, noting the huge popularity of figures such as Steve Irwin, the “Crocodile Hunter,” whose intense desire for intimacy with nature led to his death from a stingray’s barb in 2006. A fascination with predators, and with nature’s processes of “eating and being eaten” more generally, is one of the peculiar hallmarks of DGR. Taylor notes that “even being attacked by a large predator can evoke feelings of belonging and connection to nature” (127). More benign but equally intense forms of animal–human communion are described in anecdotes of interspecies communication and empathic connection. Examples include animal researchers who report—off the record—that elephants are telepathic; Jane Goodall’s accounts of nonverbal communication with chimps; and Julia Butterfly Hill’s communion with the redwoods she protects from loggers (Hill relates that as she wept and clung to the tree she named Luna, Luna responded by weeping tears of sap). While some of these experiences may sound frankly bizarre to many who otherwise consider themselves environmentalists, Taylor suggests that from DGR there may yet emerge a “global, civic, environmentalist, earth religion”— a shared, worldwide commitment to “ecological interdependence, an affective connection to the earth as home and to nonhuman organisms as kin, and the overturning of anthropocentric hubris” (197). Moreover, as tributaries to a civic, planetary religion, these dark green forces are unlikely to promote oppressive behaviors or cultural homogenization, given DGR’s emphatic commitment to cultural and biological diversity and to the intrinsic value of all life. Whatever the perils of DGR, these are “miniscule compared to the risks of an anemic response to what are potentially catastrophic environmental dangers” (218). Described in this way, there seems little reason to be afraid of the dark. This brings us to Taylor’s “personal coda.” In the interest of full disclosure, as they say, I should note that I corresponded with Taylor regarding my misgivings about his coda. Taylor concedes that in his appraisal of the relative merits of traditional and dark green religions, he “tilts to the naturalistic [as opposed to supernaturalistic] pole of the DGR continuum” (pers. comm.). This orientation is apparent in his coda and it leads to some interesting questions about this project as a whole. The coda contains a “profession” wherein Taylor affirms a profound sense (one he shares with Loren Eiseley, Aldo Leopold, Rachel Carson, and other representatives of DGR) that the universe is a “Great Mystery,” a miracle, that will forever remain impenetrable to us, at least to a certain degree. Nothing in the world fully explains the world. I happen to agree wholeheartedly with the worldview Taylor so eloquently expresses here; more to the point, I think Taylor has correctly interpreted Carson and others who see humility as the necessary—and salutary—flipside of wonder at life’s Mystery. And I could not agree more with Taylor that caring for our environment would be much easier if traditional religions were more informed by an evolutionary-ecological worldview. Taylor notes that, ever since Darwin, traditional religions have undergone “excruciating contortions in their efforts to graft [an evolutionary worldview] onto their faith traditions.” Yet “the result simply fails the laugh test for many if not most scientifically literate people” (221). Taylor suggests that we “simply let go” of these old belief systems “for which there is no evidence and many reasons to doubt” and look instead to “what we can confidently say is the real world” (221). Here Taylor appears too ready to dismiss a century and a half of efforts to find common ground between evolutionary theory and traditional faiths such as Christianity. What counts as “evidence” and “reasons to doubt”? Taylor affirms a quest for forms of religion that are sensible and sensory, as well as “rationally defensible” (222). For his money, DGR (or perhaps the naturalistic pole of it) is, because of its evolutionary grounding, a more viable candidate than traditional religions. Yet it is difficult to see what is rationally defensible about beliefs in telepathic elephants, empathic redwoods, or communion with animals that culminates in being eaten by them. I doubt these expressions of DGR would fare better on the “laugh test.” Perhaps Taylor means to say that the beliefs of DGR are to some extent rationally explicable on evolutionary grounds. His work, after all, is informed by research on the evolutionary origins of religious belief—research suggesting that religious perceptions are forms of adaptive, or once-adaptive, agency detection run amok (the “misfiring” theory favored by neo-atheists like Dawkins and Daniel Dennett) or that affective, aesthetic, and moral responses to nature are “evolutionary outcomes that generally promote environmentally adaptive behavior” (152), as suggested by E. O. Wilson’s biophilia hypothesis. In other words, one can easily hypothesize how DGR’s responses could be a product of evolution. But a scientific account of its origins does not amount to a scientific defense of its plausibility; indeed, most modern theorists who look to the natural origins of religion do so (however inappropriately) in order to discredit religion altogether. In any case, it is not obvious that DGR is in any strong sense a post-Darwinian phenomenon. Many features of DGR seem to have less to do with scientific discoveries about human ancestry than with a sensibility toward the natural world that is pre-scientific (Taylor notes that feelings of kinship, wonder, and deep connection with nature have “long been part of the human experience” ). His insistence that DGR is in some essential way realistic and Darwinian leads him to introduce an evidential standard for traditional faiths—and to find them wanting. This move brings Taylor surprisingly close to Dawkins who dismisses religious faith as “belief without evidence.” It is not sufficient, of course (though it is tempting), to refute a scholar’s position by likening it to Dawkins’s. But I would welcome more explanation from Taylor—or from his many informants who reject traditional faiths—of why some kinds of mysteries are defensible or compelling, but others are not. Why are perceptions of mystery or supernaturalism involving the sensory or “material” realm more plausible, more “real,” than similar perceptions that invoke a “nonmaterial spiritual dimension”(221)? Despite these objections, or because of them, I find Dark Green Religion to be one of the most thought-provoking, useful, and enlightening books I have read on religious environmentalism in a long time. That my objections are lodged primarily against a few passages in the book’s concluding pages illustrates how difficult it is not to admire this book. I know of no other scholar working in this field who is as conversant as Taylor in science, history of science, environmental history, and environmental literature, nor are there many who can present all these data in a style with such broad appeal. Taylor’s book is a major achievement. It has changed my thinking about the realm of religious environmentalism, and the relationship between science and religion—in ways that I am still struggling to sort out.